You are probably no stranger to Nike and their products. They’re the world’s largest apparel brand and are one of the most successful global businesses. The company continues to execute leading edge marketing strategies pioneering the future of advertising. Join us as we explore Nike’s successes and learn how you can embrace their methods to keep your business relevant in our rapidly changing world. “JUST DO IT” – Have you ever heard of a slogan more direct than that? It might be the last great tagline in advertising history. Nike’s largest demographic has an attention span shorter than that of a goldfish and the company truly appreciate this aspect of the millennial character. 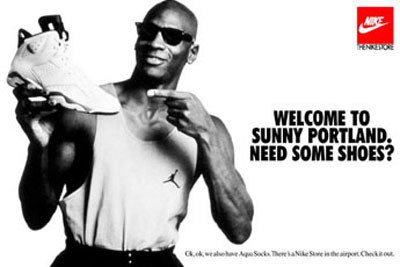 Since the late 1980’s, Nike has been strategically transitioning towards a marketing strategy which focusses almost entirely upon those three words. AND IT WORKS!! The slogan is concisely memorable yet malleable in a way that allows individuals to draw their own interpretation of the brand. It’s an infectious trademark that is unique yet ubiquitous amongst Nike fans. Rather than instructing consumers to perceive their brand in a certain way, Nike invites individuals to draw their own personal connection to the brand. And it’s incredibly effective. So save yourself the hassle of limiting your brand with complicated sales copy. Not only is it time expensive, but it’s increasingly ineffective in today’s media fragmentation. From an 80/20 standpoint, we think of it as 80% of the recall of your message comes from 20% of the words. So, focus on your key message and keep it simple. JUST (get to) THE POINT. In a world dominated by brand tribes, marketing is less about the product and more about a company’s symbolic value. The reality is that Nike’s products are nothing exceptional. They are, however, intangible representations of passion, determination and strength, derived from the athleticism of their clients. Since the dawn of time, these values have been embedded in our culture. Nike just branded them. Tribe members (and humans in general) are lost without leaders. We need successful individuals to aspire towards. There’s no point pushing brand values if there’s no leader to model them after. That’s why Nike spent in excess of $500M to secure a single athlete endorsement. The leaders of the tribe embody the brand’s values and act as a model for fellow tribe members. It’s essential that every tribe member believes that they can contribute in some way to the larger collective and that through hard work, they too can lead. This ensures the vitality and longevity of the tribe. For the Nike tribe, members are encouraged to perform to their own best. One of the company’s largest advertising campaigns centered around the phrase “Find Your Greatness”. Every tribe member (and prospective tribe member) was reminded that they too can lead in their own way. Embrace the Nike tribe and remember – there’s no one more loyal than a tribe member. This is one of the many forms of guerilla marketing crafted by Nike. It’s much less expensive than traditional techniques, yet astoundingly emphatic. The brand also explores methods of less intrusive digital advertising. Rather than purchasing millions of pre-roll ads on YouTube, the company commissioned famous YouTuber and influencer Casey Neistat to produce a short film. The video, which embodies the Nike trademark, has had over 26 million views. Those are organic views, not paid. Today, reaching consumers is less about spending, and more about connecting. If you want your company to thrive in today’s rapidly changing world, it’s essential that you stay relevant. Now, more than ever, businesses need fast, focussed and forward thinking marketing. Consider a new kind of agency. One motivated by professionals, inspired by experts, but staffed by the future.